In a house under renovation, a plumber uncovers a cellar no one knew about, and makes a rather grisly discovery -- a decapitated chicken, animal bones, and cauldrons containing beads, feathers, and other relics of religious ceremonies. In the center of the shrine is the skull of a teenage girl. Meanwhile, on a nearby lakeshore, the headless body of a teenage boy is found by a man walking his dog. Led by a preacher turned politician, citizen vigilantes blame devil worshippers and Wiccans and begin a witch hunt, intent on seeking revenge. Forensic anthropologist Temperance Brennan -- 'five-five, feisty, and forty-plus' -- is called in to investigate, and a complex and gripping tale unfolds in this deadly mix of voodoo, Santería, and devil worship. With a popular series on Fox -- now in its third season and in full syndication -- Kathy Reichs has established herself as the dominant talent in forensic mystery writing. 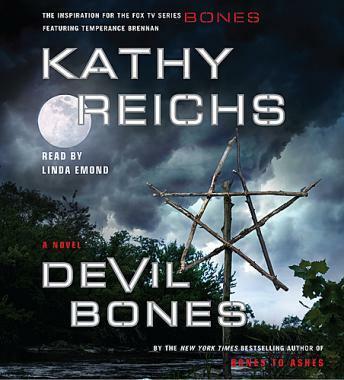 Devil Bones, her eleventh taut, always surprising, scientifically fascinating mystery features Reichs's signature blend of forensic descriptions that 'chill to the bone' (Entertainment Weekly) and the surprising plot twists that have made her a number one bestselling author in the United States and around the world. While I greatly enjoyed this book I felt that the abridged version would have been better. I am an avid fan of Ms. Reichs TV series BONES. I will read this author again. This is one book from a popular series so clearly I'm the minority here. The main character just wasn't attractive to me so I had a hard time caring about her life and job. And there was a lot of danger and drama which make you wonder how she survives as many books as she has. In a word TERRIBLE. I tried to get into this book but could not make it through more than 2 discs. What a disappointment from Kathy Reichs. Please, with all the good books out there, do not waste your time on this one!!! Returned after 1 disk. Narrator is awful and I could listen to 8 more disks of her reading.